The results of a jail study conducted by CA Fwd’s Justice System Change Initiative (J-SCI) received commendations from the San Bernardino County Board of Supervisors last week as part of a partnership between the two entities aimed at lowering the jail population. The study and the partnership made use of evidence-based data and cross-system collaboration within the county’s criminal justice system to successfully reveal areas of opportunity to lower the jail population, while maintaining public safety. 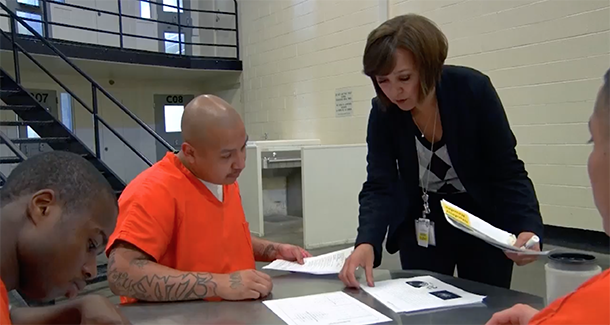 CA Fwd has also conducted jail studies in Riverside, Santa Cruz and El Dorado counties. CA Fwd and San Bernardino County partnered in 2014 when the Board of Supervisors adopted a resolution to participate in CA Fwd’s “Achieving Better Outcomes through Data-Driven Change” project. Since then, CA Fwd’s J-SCI team has worked with the county’s Law and Justice Group to build a culture and capacity for data-based decision-making and continuous evaluation and improvement; to examine rehabilitation efforts and focus on programs that positively affect recidivism; and to improve public safety outcomes and reduce costs. Part of that process was to conduct a jail study to understand who was in jail, why and for how long. The study found new crimes or front door entries represented 59 percent of bookings in 2016 (study year), while the other 41 percent were side door entries (bookings for technical supervision violations, court commitments, warrants, and holds). Additionally, the average daily population in 2016 was split at 55 percent front door and 45 percent side door entries. With the exception of person crimes, warrants used the most jail bed days. Reduce jail days through the front doors by maximizing pretrial releases and programs and find ways to divert certain bookings for alcohol-related arrests. Develop alternatives to reduce side door entries by delving more deeply into warrants to better understand opportunities to reduce impact, explore potential to increase alternative responses to technical violations and expand community-based custody alternatives for sentenced individuals and probation violators. Develop programs and alternatives to reduce jail recurrence and recidivism by developing interventions to improve mental health outcomes and reduce jail time for the mentally ill and working collaboratively to better address substance use and abuse. “CA Fwd provided the algorithm,” said San Bernardino County Undersheriff Shannon Dicus while addressing the Board. “Now we have an analyst that we pay for with AB109 monies embedded with Law and Justice [Group] and will actually keep this study going and report back to you and all of the department heads as to what our progress is.” He added the Sheriff’s Department will also add an analyst to track data and evaluate the progress of the department’s programs. San Bernardino County’s Sheriff’s Department and Department of Behavior Health have instituted new programs aimed to reduce recidivism including Corrections to a Safer Community (CTASC), the START program, the new Sheriff’s Reintegration Pilot Program and the inclusion of the DBH on the county’s Law and Justice Group, a committee that includes all the county departments involved with the criminal justice system.